In a purely traditional Vosges style, this former farm welcomes a small boutique hotel, where Valérie and Stéphane, who have a passion for cooking, will welcome you “like at home”. In the quiet countryside, you will find 14 rooms, of which two family suites with massaging showers, a play room, a huge garden… Everything here invites you to reenergize and treat yourself. At the Charriole table, the owners take turns in wearing their Chef’s hat and propose a 100% home-made local cuisine, made of neighbouring farms’ delicious products and vegetables from their own garden. One feels pleasantly well at the hotel and the restaurant, and some even choose to privatize the place for a celebration’s time. Think about it! 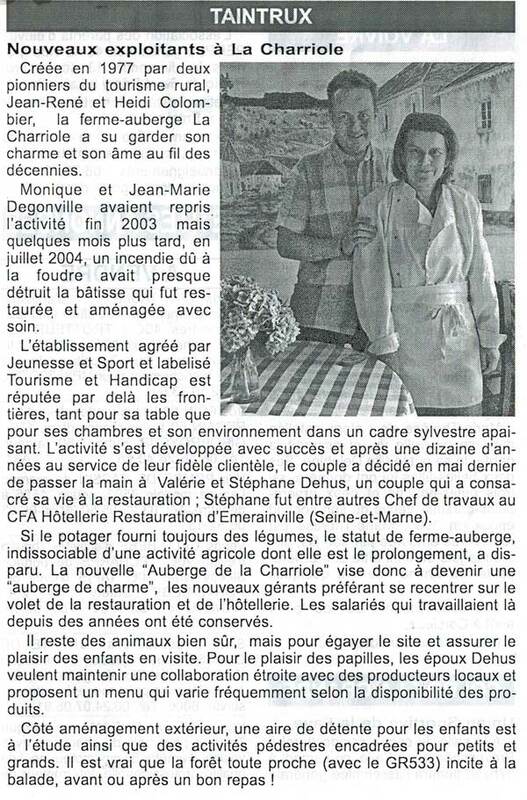 La Charriole in Paris Match! 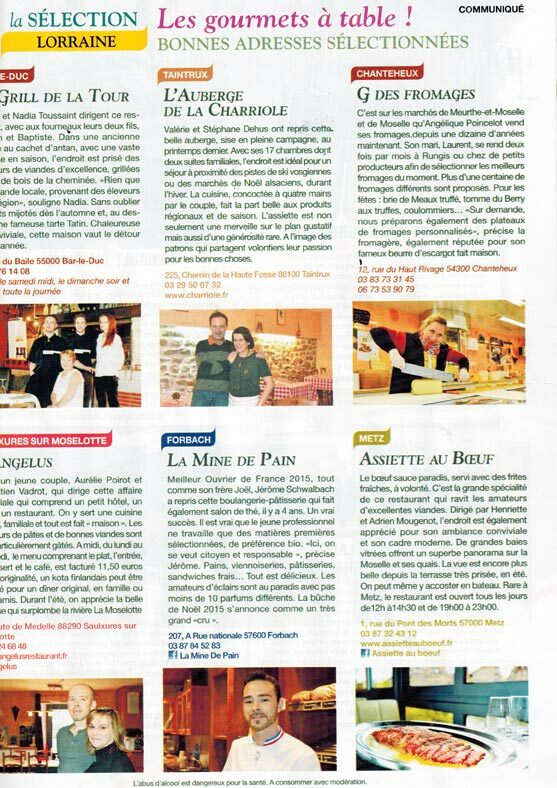 In its December 10 and 17 issues, Paris Match makes a Lorraine selection called “Gourmets, the table’s ready!”, where it points several Lorraine addresses. 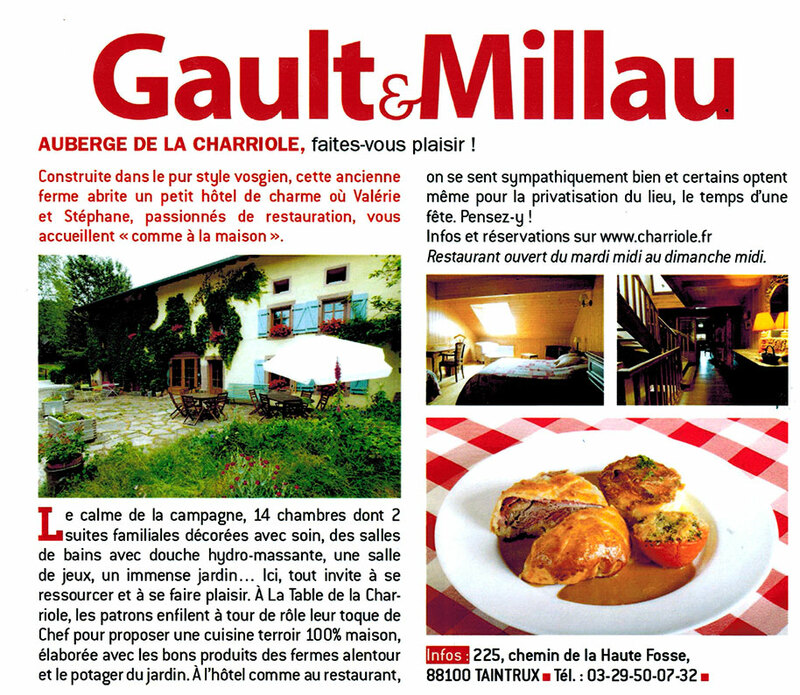 Valérie and Stéphane Dehus took over last spring this beautiful auberge, settled in the heart of the countryside. With 17 rooms (of which two family suits), the place is ideal for a winter stay nearby the Vosges skiing slopes and Alsace’s Christmas markets. The cuisine, cooked together by the couple, glorifies regional and seasonal products. The dishes are marvelously tasty and incredibly generous! Just like the owners, who take pleasure in sharing their passion for good things. As many as 90 members of the Club vosgien met at the Charriole, on Tuesday November 3, for their 2015 end-of-season meal. Start a tasty 2016: la Charriole presents our new Year’s Eve menu. As usually, it is proudly cooked with fresh local products. And comes with a children’s version! In Vosges Matin, August 30, 2015. 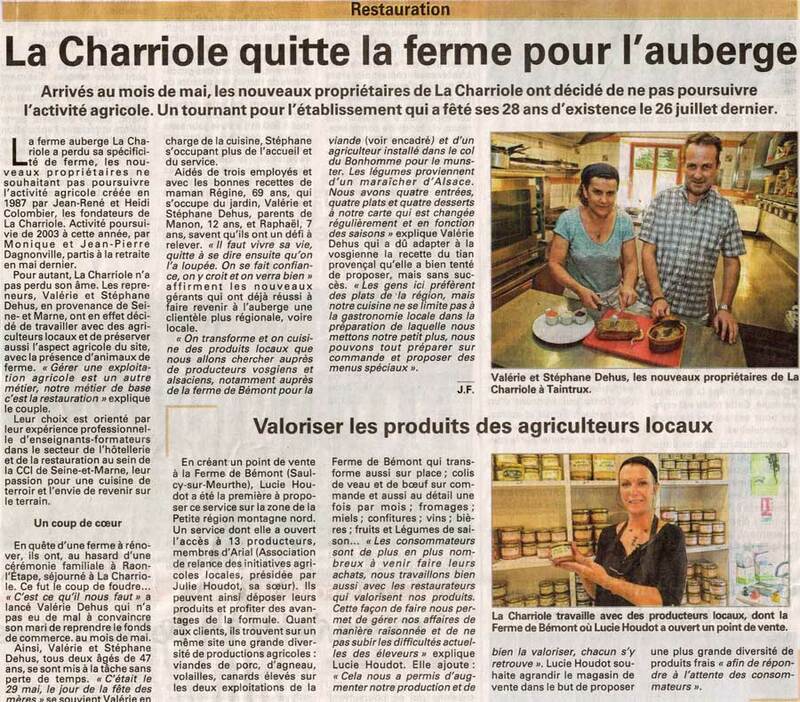 A short article on the beginning of our new adventure at the Charriole.